Facebook is the most popular social media platform (although Youtube is for video), with somewhere close to a billion users, you can be sure that your customers (or potential customers) are active in some capacity on Facebook. There are some benefits and downfalls to using Facebook for business, but in my experience the benefits easily come out on top. Although there are huge differences between Facebook and Twitter, like Twitter there is literally no end to the amount of conversations you can become a part of. Different from Twitter is how you find those conversations, and they are a little less than real-time. To get started you need to have a personal account on Facebook to make your own fanpage. There is no fanpage that does not have a personal account attached to it. No exceptions! A fanpage will allow you to share updates, have visitors post to you, and collect an unlimited number of followers. The unlimited number of followers is the most important issue here. You get likes and they are your fans, or followers. You can not participate in groups as a fanpage, but you can like other fanpages, write on their pages, etc. A profile allows you to become friends with others, you have to accept them, and they have to accept you. You get up to 5000 friends, and have restrictions on reaching your fans because once they categorize you as an acquaintance you are even more unlikely to show in their newsfeed. Last but not least on this issue, Facebook allows 1 account per person and can delete extras at any time, would you want them to delete your business account, especially if you spend so much time building it? Choose Community because you want to build a community around your business, products and services. If you fill in the form for the local business, they use this information in your about area, and you’d rather have a website link there so that you can bring traffic from Facebook to your website. You will see several options that you can skip through as you finish setting up. Add a profile picture when you go through, if you have an image that was made specifically for Facebook, meaning a designer made it 180×180 in size. You can use something else, and then drag it to where you want, but getting a designer will help you with presenting a more professional presence. Next you’ll want to fix the About section seen in the photo below. You’ll go into the Update Info area of your page to make the changes, just like the photo below. 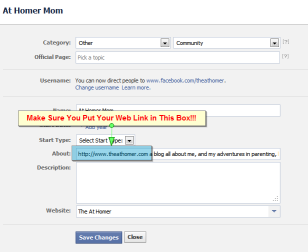 Make sure you put your web link in the appropriate About box, with a description of your business, like the photo here. If you are hiring a designer you can have them make the cover image (the really big pic on the top of the fanpage) that is 851*315, if not you can upload a pic that encompasses the idea of your business, and drag it to look nice. Please keep in mind there are restrictions of what you can put on your cover image, you can describe your business, you can’t ask visitors to like you, include your web address, or phone number, etc. Designers should know about these restrictions but it is perfectly fine to ask them. Your fanpage should now look good, but there is a lot to do still. Tomorrow we will discuss how to go through settings for your fanpage, allow users to message you, and get a nice, pretty link to share with others. Sign up for emails in the right sidebar to get the blog post when it goes live. © 2012 – 2014, Social Media Consultant. All rights reserved. Discover 5 methods for generating more leads by using social media and content marketing together for powerful results. Yup, facebook allows businesses to open or create a fan page by following the most simple steps. If you want to stay connected and increase your clients than the facebook fan page is a “must”.